In a world where cities have wheels and eat each other, prey is running out. Sooner or later, London will have to starve, and become static once more. But the Lord Mayor has over plans. With an ancient weapon garnered from the Sixty Minute war that happend a long way back, Crome hopes to reinstall London as the greatest city in the world. Only the Anti-Traction League stands in his way, and Tom must decide which side he is fighting for. I remember when I first read Mortal Engines, two and a half years ago. It was part of a term long English project, and we were reading it in class, every lesson another chapter or so. I distinctly remember always reading ahead, excited about what was happening in what Phillip Reeve always refers to as the WOME: the World of Mortal Engines. 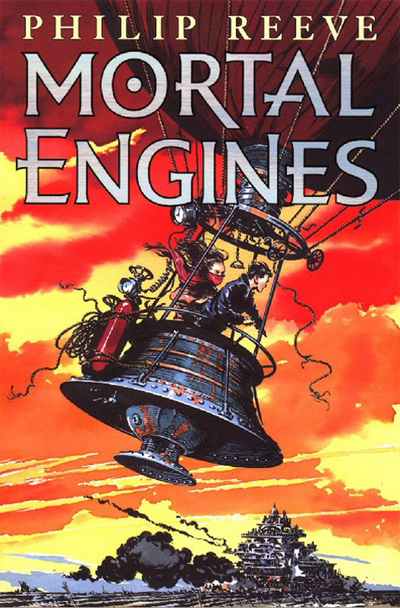 Picking Mortal Engines up again was an intresting thing. I’d forgotten a lot of what happened, especially towards the end of the book, but some scenes were still clear in my head. Among these was the opening paragraph*. I love the way how Phillip Reeve introduced us to London first, rather than any of the characters. This first paragraph seems to establish all the things we need to know about the WOME, and yet manages to do it in an intresting and strangely artistic way…I could always picture London speeding on, through the classic British weather described… The first line alone seems oddly captivating, seemingly managing to show us what Mortal Engines is about; in some ways, it can be described as a mission statement for the whole book. It is one of the greatest opening lines I have read in modern fantasy/sci-fi/steampunk. Throughout the rest of the book, Phillip Reeve manages to continue the intriguing start, with the same style of writing; vivid descriptions which are intresting to read but doesn’t slow any of the story down. The powerful narrative manages to keep the climactic scenes tense and moving, and the tender moments innocent and loving, and the lovely delicate romances seem far more natural and beautiful than many other books, especially as the romance is rather different to the classic Hollywood setup, and not cliché in any sense! The descriptive narrative of Reeve seems also to make Mortal Engines realistic and very believable… Phillip Reeve manages to give explanations, and the historically factor of the WOME just adds to this realism. The world in which Hester and Tom live in seems quite feasable, and the world building of The WOME is very complete; it seems there is no half heartedness about it. Most if not all of the characters are wonderfully developed, including those who are not see a lot (the characters of Pomeroy and Anna Fang come to mind). Hester is a very intriguing character, and it is thrilling to read about her motivations and how she acts. Shrike, also, is quite odd… It’s very hard to describe, but if you’ve read Mortal Engines you’ll understand what I am saying… He’s a fascinating person, if I can call him that, and he too has some oddly hypocritical motivations. I’ve read numerous reviews by people mentioning the lack of emotions displayed by Tom’s character. I think this is certainly true throughout the beginning, but towards the end, this seems to fade, particularly in the final chapters. I didn’t really mind it, anyway; the sheer amount of other great characters soon makes up for this slight flaw, and even then, Tom is still an above mediocre character. Older readers will also see some of the underlying themes, which, when I read it at age 11/2, I did not see, but now at 14, I do. The theme seems to question the convention of heroism and beauty; How far should you go to be a hero? Mortal Engines brings these questions up in a very subdued, mysterious way, which is in no way preachy or moralistic. I think this is one of the factors that makes it so appealing to adults also; not only the facinating plot, characters and world they live in, but also this underlying moral questioning. I’ve seen Reeve’s writing compared quite a lit with Pullman’s, and Both Mortal Engines and Phillip Pullman’s His Dark Materials have similar elements of being set in a steam punk world…but the similarities end there. Both are critically acclaimed; but it seems that Mortal Engines is not as famous as His Dark Materials, which is a shame, because it is just as good, if not better. So if you enjoyed Northern Lights, then you’ll certainly enjoy Mortal Engines. Even if you’re way in your twenties, thirties, forties and fiftys, you are sure to live this enthralling fantasy come steampunk book. It’s a great page turner, and every sentence adds something to the book. I highly recommend it to everyone. What did you think about Mortal Engines?